The Atlux mount is a superior German equatorial mount supplied with the Star Book GO-TO controller. The mount is designed and manufactured to offer the best slewing and tracking performance in an easily transportable package. Ideal for long exposure astrophotography. Star Book controller supplied as standard with the Atlux mount. The mount has been designed to be as compact as possible whilst still providing a stable and portable telescope platform. The counterweight shaft is retractable for transport and storage. 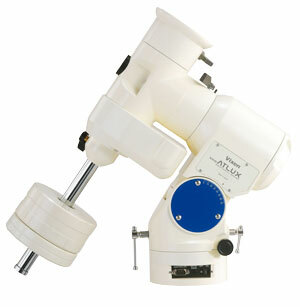 The Atlux can easily accommodate advanced astrophotography payloads up to a maximum weight of 22kgs. The mount is supplied with a dovetail mounting block as standard. See below for accessory plate options. For attaching the Dovetail Plate mounting block on the mount head. For installing an optical tube with the standard dovetail attachment. Usable with Atlux Accessory Plate, Atlux Base Plate or SX Accessory Plate DX.